High Court is established for presidential Impeachment purposes; an extra-judicial body, the Constitutional Council, reviews the constitutionality of laws; no other part of the court system is referenced. 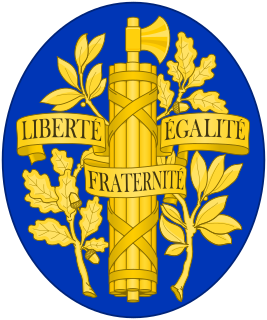 The current Constitution of France was adopted on 4 October 1958. It is typically called the Constitution of the Fifth Republic, and replaced that of the Fourth Republic dating from 1946. Charles de Gaulle was the main driving force in introducing the new constitution and inaugurating the Fifth Republic, while the text was drafted by Michel Debré. Since then the constitution has been amended twenty-four times, through 2008. The preamble of the constitution recalls the Declaration of the Rights of Man and of the Citizen from 1789 and establishes France as a secular and democratic country, deriving its sovereignty from the people. It provides for the election of the President and the Parliament, the selection of the Government, and the powers of each and the relations between them. It ensures judicial authority and creates a High Court (a never as yet convened court for trying the Government), a Constitutional Council, and an Economic and Social Council. It was designed to create a politically strong President. It enables the ratification of international treaties and those associated with the European Union. It is unclear whether the wording (especially the reserves of reciprocity) is compatible with European Union law. The Constitution also sets out methods for its own amendment either by referendum or through a Parliamentary process with Presidential consent. The normal procedure of constitutional amendment is as follows: the amendment must be adopted in identical terms by both houses of Parliament, then must be either adopted by a simple majority in a referendum, or by 3/5 of a joint session of both houses of Parliament (the French Congress) (article 89). However, president Charles de Gaulle bypassed the legislative procedure in 1962 and directly sent a constitutional amendment to a referendum (article 11), which was adopted. This was highly controversial at the time; however, the Constitutional Council ruled that since a referendum expressed the will of the sovereign people, the amendment was adopted. Prior to 1971, though executive, administrative and judicial decisions had to comply with the general principles of law (jurisprudence derived from law and the practice of law in general), there were no such restrictions on legislation. It was assumed that unelected judges and other appointees should not be able to overrule laws voted for by the directly elected French parliament. Since then, the possibility of sending laws before the Council has been extended. In practice, the political opposition sends all controversial laws before it. Social welfare, which means that everybody must be able to access free public services and be helped when needed. Laïcité, which means that the churches are separated from the State and the freedom of religion is protected. Democracy, which means that the Parliament and the Government are elected by the people. Indivisibility, which means that the French people are united in a single Unitary sovereign State with one language, the French language, and all people are equal. The Constitution defines in Article 89 the rules for amending itself. First, a constitutional bill must be approved by both houses of Parliament. Then, the bill must be approved by the Congress, a special joint session of both houses; alternatively, the bill can be submitted to a referendum. In 1962, president Charles de Gaulle controversially submitted a bill to a referendum through another procedure defined at article 11 of the Constitution, a procedure which allows the President to hold a referendum without the consent of Parliament – see French presidential election referendum, 1962. This permitted the establishment of a popularly elected presidency, that would otherwise have been vetoed by the Parliament. Article 11 was used for constitutional changes for the second and last time in 1969, but the "No" prevailed, causing Charles de Gaulle to resign from the presidency. France has had numerous past constitutions. The Kingdom of France, under the Ancien Régime, was an absolute monarchy and lacked a formal constitution; the régime essentially relied on custom. Albeit, some rules were above the king : les lois fondamentales du Royaume (fondamental rules of the Kingdom). These rules were mainly about the inheritance of the Crown. The king shall be the first born (primogeniture) male catholic heir. In any case, women weren't allowed to inherite the Crown since the Treaty of Troyes. Parlement of Paris (which was a Court during the Ancien Régime) was the body which applied these rules. For instance Louis XIV tried by his will and testament to change the inheritance order. The Parlement of Paris annulled it. ^ "Les révisions constitutionnelles". Conseil Constitutionnel. Retrieved 15 June 2016. ^ "France backs constitution reform". BBC News. 21 July 2008. Retrieved 4 September 2009. ^ "Le testament de Louis XIV". www.histoire-image.org (in French). 10 September 2015. Retrieved 18 December 2018. ^ "Le testament et les codicilles de Louis XIV". mediatheque-numerique.inp.fr. Retrieved 18 December 2018. "Constitution". Journal Officiel de la République Française (in French): 9151–9173. 5 October 1958. Retrieved 14 May 2012. Ghevontian, Richard (1979). L'élaboration de la Constitution de la Ve République (Th. Etat). Aix-en-Provence. Oliva, Éric; Sandrine Giummarra (2011). Droit constitutionnel. Aide-mémoire (in French) (7 ed.). Paris: Sirey. ISBN 978-2-247-10965-4. Frédéric Monera, L'idée de République et la jurisprudence du Conseil constitutionnel – Paris : L.G.D.J., 2004 -. Martin A. Rogoff, "French Constitutional Law: Cases and Materials" – Durham, North Carolina: Carolina Academic Press, 2010. "La Constitution". Légifrance (in French). Retrieved 14 May 2012. "Constitution of October 4, 1958". Assemblée nationale. Retrieved 1 February 2015. "Constitution of 4 October 1958". Conseil constitutionnel. Retrieved 14 May 2012. "Texte intégral de la Constitution du 4 octobre 1958 en vigueur". Conseil constitutionnel (in French). Retrieved 14 May 2012. "Constitutional council of the French Republic". Retrieved 14 May 2012. The President of the French Republic is the executive head of state of France in the French Fifth Republic. In French terms, the presidency is the supreme magistracy of the country. A preamble is an introductory and expressionary statement in a document that explains the document's purpose and underlying philosophy. When applied to the opening paragraphs of a statute, it may recite historical facts pertinent to the subject of the statute. It is distinct from the long title or enacting formula of a law. The Constitutional Council is the highest constitutional authority in France. It was established by the Constitution of the Fifth Republic on 4 October 1958 and its duty is to ensure that constitutional principles and rules are upheld. It is housed in the Palais-Royal, Paris. The Constitution of Cameroon is the supreme law of the Republic of Cameroon. Adopted in 1972, it is Cameroon's third constitution. The document consists of a preamble and 13 Parts, each divided into Articles. The Constitution outlines the rights guaranteed to Cameroonian citizens, the symbols and official institutions of the country, the structure and functions of government, the procedure by which the Constitution may be amended, and the process by which the provisions of the Constitution are to be implemented. A referendum on the direct election of the President was held in France on 28 October 1962. The question was whether to have the President of the French Republic elected by direct popular vote, rather than by an electoral college. It was approved by 62.3% of voters with a 77.0% turnout. However, the reform was controversial because it strengthened the executive at the expense of Parliament, and because of the disputed constitutionality of the procedure used. In French politics, an ordonnance is a statutory instrument issued by the Council of Ministers in an area of law normally reserved for primary legislation enacted by the French Parliament. They function as temporary statutes pending ratification by the Parliament; failing ratification they function as mere executive regulations. Article 49 of the French Constitution is an article of the French Constitution, the fundamental law of the French Fifth Republic. It sets out the political responsibility of the government before the parliament. It is part of Title V: "On the relations between the parliament and the government". Léon Philippe Jules Arthur Noël was a French diplomat, politician and historian. The Council of the Republic was the name of the upper house of the legislature of the French Fourth Republic (1946–1958). It was replaced by the Senate when the constitution of the French Fifth Republic came into force. The politics of France take place with the framework of a semi-presidential system determined by the French Constitution of the French Fifth Republic. The nation declares itself to be an "indivisible, secular, democratic, and social Republic". The constitution provides for a separation of powers and proclaims France's "attachment to the Rights of Man and the principles of national sovereignty as defined by the Declaration of 1789." In France, the French constitution of 4 October 1958 was revised many times in its early years. Changes in this fundamental law have become more frequent since the 1990s. This has had two major causes: the desire to modernize public institutions on one hand, and adapting to the European Union and to international law on the other. Locally, a local referendum initiative. The Tunisian Constitution of 2014 was adopted on 26 January 2014 by the Constituent Assembly elected on 23 October 2011 in the wake of Tunisia's Jasmine Revolution that overthrew President Zine El Abidine Ben Ali. It was passed on 10 February 2014, replacing the constitutional law of 16 December 2011 that temporarily formed the basis of government after the suspension of the Constitution of 1959. States of emergency in France are dispositions to grant special powers to the executive branch in case of exceptional circumstances. A state of emergency was declared following the November 2015 Paris attacks, which expired, after five extensions, in November 2017.